Sara Teasdale was born in 1884 and had such poor health for so much of her childhood, she was home schooled until age 9. Sara’s first poem was published in Reedy’s Mirror, a local newspaper, in 1907. Her first collection of poems, Sonnets to Duse and Other Poems, was published that same year. In 1918 she won a Pulitzer Prize for her 1917 poetry collection Love Songs. 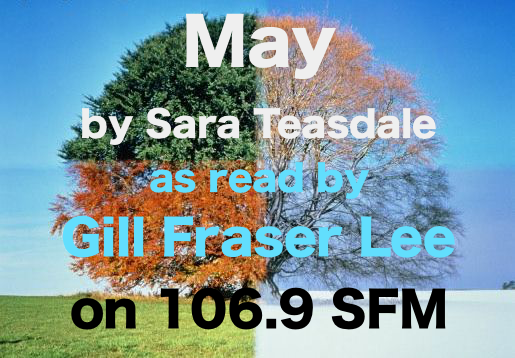 Gill Fraser Lee reads her poem May – broadcast on Jason McCrossan’s breakfast show on 106.9 SFM.